about 30 points on the Photoshop scale. Okay.. I'm not much of a mini guy (at least before this project). I have Warhammer 40k from 1993, still in the box with most of it still on the sprue.. (I need to get around to selling that on Ebay). So when I started this, what little research I did on scale led me to take a couple of the Warhammer minis out of the box and measure them. I also have a near complete set of RIFTS minis from the 90's and measured a couple of those as well. 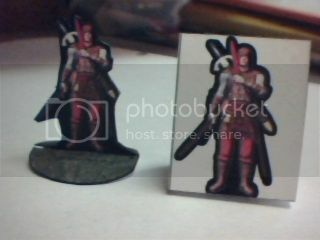 Then I took some of the free paper minis on DrivethruRPG and measured them as well. What I'm finding however is that they're all too small. A few hundred extra K on the final document shouldn't be a concern next to putting out the quality I want, and making these guys workable for someone who's also using real minis is part of that. Likewise, the bigger they are the more detail comes through. So after seeing your print and cut, I've altered my post-work process to produce this; I think it's still a bit smaller than your big one, but it should be pretty close. The colors turned out great for me - how about anyone else? Awesome. If I trim a few hairs off the top and bottom of the base tabs I can get 24 on a page (with a .25 inch margin). That's 3 less per page than my original design but clearly a much better setup.. Okay, this one is just a hair shorter, allowing me to stack them three rows of eight on a letter sized page. 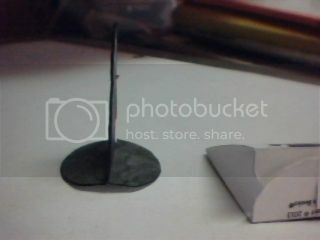 Could someone do me a favor and try making one as an A-frame so I know if the tabs are long enough.. For me being able to just slice the lines at the top and bottom and put them into each other means not having to use any glue or tape, just cut, fold and go.. Pardon the quality of the photos, until I get my camera back, I have to make do with the photography tools I have at my disposal at the moment. The tent-fold works just fine, even without glue. For the paper-mini version, I add a texture to the base flaps before I printed it out, and I also added even more black to the outline just to smooth things out for easier cutting (I cut by hand). The base of the mini is just the base of the tent-fold, but folded out instead of in. Nice! I really appreciate it guys.. Now all I have to do is recreate my post-work process; I neglected to turn of the 'record process' button at the end of my last script and crashed photoshop, causing it to erase all the progress I made last night. 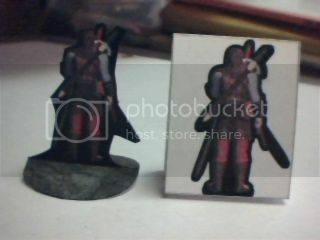 Here's one of the four freebies from the sample package, a Dwarf Gladiator. Another from the sample set, an Elf Gladiator.. Also a close-up of the detail lost in the reduction to mini size..
Interesing closeup. What about a sheet of "character face cards" to go with the "personality" minis? Last one of the minis from the sample set, a Wolfen Gladiator.. 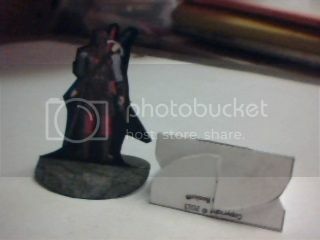 Note this is to scale with the other minis (he's a crouching ten feet tall)..
Hey, thought I'd update you guys on goings on.. I haven't accomplished much in the past month as tomorrow is the settlement hearing for my workers compensation.. The stress has been fierce, so creativity has slowed to a snails pace. Still, when tomorrow is done, and after the long trip to Ohio over the weekend for my daughter's Gymnastics meet, I'll have a much more clear view of my future, which should mean a much more productive window of opportunity is just around the corner. Thanks. Unfortunately nothing happened. The Insurance reps never showed so the hearing has to be rescheduled. When it was scheduled in the first place it was at one location, and then half a month later they sent out a notice that it was canceled, accompanied by a notice that it was actually just moved to a new venue. Only the insurance claims they didn't get the notice of a new venue. So I'm out of money and have no settlement. Monday I'm talking with a lawyer. The Judge said she'd handle my case via teleconference to make it more convenient, so there's a chance it can be done sooner rather than later. And although they claim they didn't get the notice of change of venue, they sent me the initial settlement offer via email two days ago.. That's too convenient a coincidence in my mind. That, coupled with the fact that their offer is less than 10% of what it should be tells me a Lawyer is necessary. Yes, I'm finding that out. Hopefully one will be useful.. I have a call into a firm now and expect to hear back in the morning. A Little update; In Missouri the insurance has no legal obligation to provide me with vocational training even though I am no longer physically capable of working in the industry I was in before.. The lawyer said he could probably get my disability rating doubled. This is not interesting to me, as it would mean another year before I get a settlement and with having to pay his expenses along the way and give him 20% I would be lucky to get a couple of hundred dollars more than what they're offering me now. So no lawyer, and a new hearing scheduled for April 18th. Meanwhile I have to find income fast or we're going to lose everything. So naturally my creativity has been a bit stifled as of late. However, I do appreciate the input you guys have given me along the way, so I've got a special extra for you. I'm working on a sourcebook for Palladium Fantasy adapting their first edition Fantasy adventure "The Tombs of Gersidi" to second edition. Since I'm more artistic than literal, I've worked on character portraits before doing the writing and intend to do a package of miniatures to complement the game book. To that end I give you the Marquest clan, key NPC's in the adventure. The Baron and his sons. I'll probably pull these down in a month or so, so get them while you can. It's been a month, so down they came. Okay, this weekend I'm taking the Marquest's down, but here's a random Thug from the second set.. Cheers. Do you know when a your commercial set will be published? It's still up in the air. I have my first job interview tomorrow, and the settlement hearing on Thursday; if I get the job I don't know how long it will take me to get settled into a routine, but I should be able to work on them while at work there; I'll also be going to college for the first time a mere 21 years after finishing my primary education.. I'm still hoping to make it this summer, but again, it's hard to tell..
Can you give me an example of what you mean by "more life/personality"? First of all, welcome jjms313. A personal opinion is never a "... trying to be a jerk ... " matter, imho. It is based on preferences, tastes, needs and personal experiences. it may not be shared, but it is always respectable. In this specific instance I don't know if I agree with you or not. Because I don't quite understand what you mean exactly. The figures' characterization is given by especially author's original drawing, imho. But this is extremely low with CG works. This kind of figure can only be morphologically correct, colorful, original in detail ... but it is very difficult to characterize them, and it can do very little anyway. I too consider myself a huge paper mini customer. So, if you like, a few examples ( Arion Games, Dramascape, Fox Forrester's minis, Dakkar Unlimited, Finger & Toe, Neboulus Ceations, Sphere Productions, Sade, Imperium Group ... all CG figures ) would help me to understand better what you mean. Yes, I should have been more elaborate myself. I didn't welcome you to the boards as I'm pretty new myself, but I in no way took your post as offense, and meant none with my request for more detail. 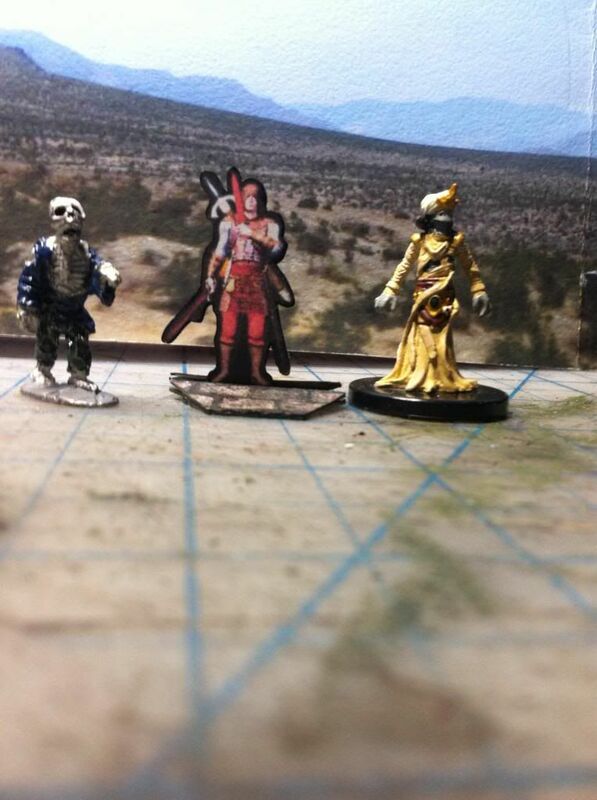 Are you a consumer of other 3D rendered minis? I know that my style of post-work is generally considered unappealing to the fans of 3D, whereas 3D is considered unappealing to a large portion of humanity due to the uncanny valley..